Our chamber members share common interests in preserving and improving the quality of life for our area; in assuring that our schools and educators receive the support they deserve in order the give our youth the best possible head-start in life; and in assuring a skilled and highly trained labor pool for the millennium. Public school education in the Cypress Fairbanks area is outstanding, and primarily provided by the Cypress Fairbanks Independent School District. The district has established a strong academic and sports competition reputation in Texas. 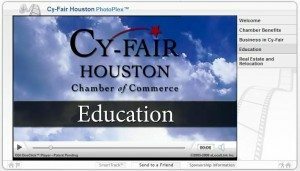 It educates the second largest student population in Harris County. Higher learning has become an integral part of the Cy-Fair community, with convenient access available to many four-year college institutions and exceptional choices for professional development and technical training. The Cypress-Fairbanks Independent School District encompasses 186 square miles; making it the second-largest school system in land area in Harris County (only Houston ISD is larger). To learn more about CFISD visit www.cfisd.net or call the Instructional Support Center at (281) 897-4000. Lone Star College-CyFair serves nearly 18,000 students and remains focused on offering responsive workforce and transfer programs to enhance both economic development and quality of life in Cy-Fair. The college provides a wide range of academic choices, workforce certificates and associate degrees as well as university transfer and variety continuing education activities for a lifetime of learning. In addition, the Small Business Development Center offers free business management and consulting services and a variety of low-cost workshops and seminars. Lone Star College-University Park is a full service satellite center of LSC-Tomball designed to serve the greater northwest Harris county area. LSC-UP offers a selection of day, evening and weekend credit courses, including university-transfer courses and certificates. Services include free tutoring, career advancement, financial aid, learning center, library services, bookstore, café and adult education courses. at University Park -Through the partnership of LSCS and several four-year universities, the LSC-University Center at University Park offers junior, senior and graduate-level classes, in addition to the two-year programs. Students who enroll with one of the partner universities are able to complete a bachelor’s or master’s degree (or teaching certificate) on site, without traveling to the university campus. Located within the LSC-University Park facility, offers customized employee training and education. By analyzing a company’s business needs, Corporate College professionals develop relevant training solutions required for a business’s most important asset — human capital. Park and offers local businesses a state-of-the-art conference center with 19 meeting rooms – affordable accommodations for meetings of any size. For more information, contact us atcorporatecollege@lonestar.edu or 281-296-7827. Eight colleges and schools boast undergraduate, masters and doctoral degree programs in engineering, sciences, architecture, business, technology, criminal justice, humanities, education, nursing and social sciences. For more information about the PVAMU visit www.pvamu.edu. Private schools in Cypress and Jersey Village are an excellent alternative to public schools. Smaller classes, extended hours, programs for pre-school, and a variety of teaching methods are some of the advantages for students who elect to attend private school. Please visit our Member Directory.